My wife and I recently bought a house in a quiet neighborhood just north of Salt Lake City. We have a two-and-a-half-year-old daughter and the most important thing to me is making sure she’s safe. Now, I wouldn’t consider myself to be the overly paranoid, watching out the window with a pair of binoculars type, but I have seen my fair share of Criminal Minds episodes, so I’ve been on the lookout for an affordable security camera system that works for us. I wanted something self-monitored that I can arm with my phone and that will send me notifications of any suspicious activity. More specifically, I want a system that can function for both security and practical reasons, like keeping an eye on my daughter when she’s playing in the basement. I’ve reviewed the Funlux 4-Channel system, but it wasn’t really what I was looking for. 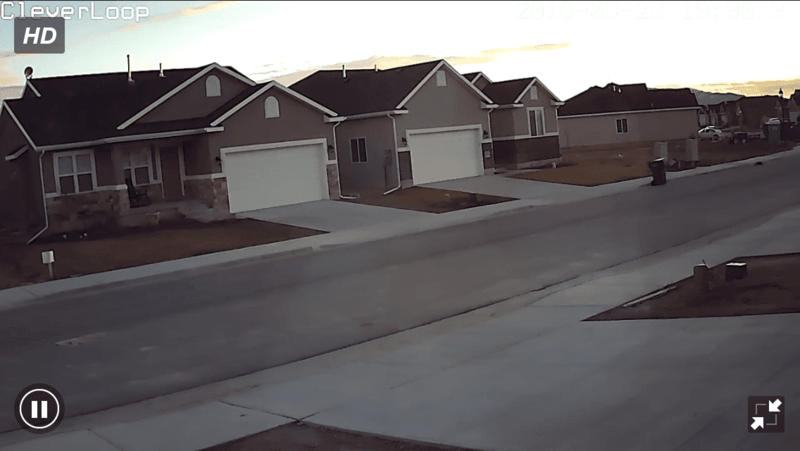 Then I came across CleverLoop’s smart detection, and I think I’ve found a security camera that does everything I want (with a few cool extras), and comes at a reasonable price. Summary : Cleverloop is a DIY home security camera system that learns in-home traffic patterns and reports suspicious movement directly to the user's cellphone. It's our choice for best DIY camera systems. How much does CleverLoop cost? This might seem a little pricey compared to the Funlux 4-Channel, seeing as you get four cameras for $399, but the CleverLoop base unit with its smart detection more than makes up the difference. How easy is the setup? The system does not come with any physical instructions. Everything is explained through the CleverLoop app, which is available for both iOS and Android. The app does a fantastic job of walking you through setup step-by-step, with mini instructional video clips for each phase. The base station has to be plugged directly into your router and you’ll want to connect your cameras in the same room as your router for the initial setup; otherwise, you won’t get a signal. 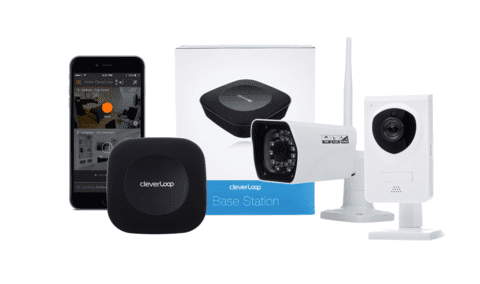 Indoor and outdoor cameras have a slightly different setup process, but CleverLoop provides instructional mini-videos help you during the setup process. The setup for CleverLoop was a very smooth and easy process. The instructions at the bottom of each screen are clear and informative. It even tells you the approximate time it should take to register each camera with the system, and has a countdown timer for each. For me, the outdoor camera took longer than the app indicated; I had to wait about 25 seconds after the timer went off before it connected. I figured this out after my third restart, so try waiting beyond the timer if you’re not connecting right away. I ran into a small obstacle while trying to connect the cameras to my Wi-Fi network. My main network is a 5 GHz because I prefer increased speed. Most Wi-Fi security systems operate on a 2.4 GHz network because it has a great coverage area, but slower speeds. Since the system is set up through the CleverLoop app, and my default connection is a 5 GHz network, the Wi-Fi cameras would not connect. After some struggle, I realized my simple mistake and switched my smartphone over to the 2.4 GHz network for setup. Make sure to check your network settings before you dive in and the setup process will go a lot more smoothly. Because the CleverLoop system is rich in features, we are going to divide them by base station, indoor camera, and outdoor camera, so we can focus on what each component brings to the table and how it works in the system as a whole. CleverLoop markets the base station as the “brain” of the entire system, which is exactly the right word to describe this central console. The base station actually learns common patterns and will only alert you when something is out of the ordinary. What we really like about this feature is that it’s not just simple motion-sensor technology. CleverLoop learns the difference between your dog running around the yard and someone climbing in your windows, snatching your people up. You can customize and fine-tune the smart detection feature for each area of your home you are monitoring. 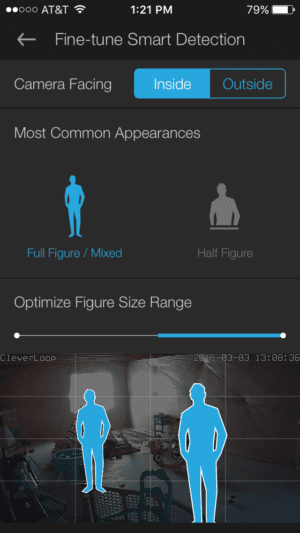 I’ve optimized the smart detection to alert me of any movement not within the specified size range, or height range of the person captured on camera. This means when my daughter goes down to play in the basement, I will receive a notification on my smartphone, because she’s shorter than my presets and will trigger an alert. At first, I received an outrageous number of notifications. The smart detection sends an alert with a 10-second video clip each time it’s triggered, and asks you to specify whether it’s just a trivial movement or an alert. Initially it was blowing up my phone with alert after alert, like any other normal motion sensor alert system would do. Until the system is programmed and learns what you consider to be important, you can expect to receive alerts for everything. Once I had specified Alerts vs. Movements, as the picture shows, I stopped receiving unnecessary notifications. This process only took about a day before the majority of motion alerts were categorized. This same process can be used for the outdoor camera smart detection. After three days, I only received alerts when my daughter is downstairs by herself, which is what I wanted. The CleverLoop app really stood out to us as an easy and effective tool to manage the overall system. The ability to customize alerts and determine which movements are important to you allows the system to be used for multiple purposes. But our favorite control feature has to be the geo-fencing capability. CleverLoop uses your smartphone’s GPS and arms the system as you leave, and disarms it again when you return home. I was pretty impressed with the video clarity. However, even with pretty clear HD video, an intruder would have to get relatively close to the camera to get a positive ID. CleverLoop gives you the option of standard-definition and high-definition footage, so you can store more video at a lower quality. I installed the indoor camera above the mantel of my fireplace. The image cuts off just below the far couch line, but there’s about 15 feet of living room space that gets cut off with it (as well as the majority of the kitchen and the entire dining room). The only way I could think to fix this was to install the camera at a higher vantage point, but seeing as it needs to be plugged into a power source, this wasn’t a reasonable option, unless I wanted an ugly power cord hanging down my living room wall. A wider field of view would make this sweet indoor camera even better. Two-way audio for me is a huge plus. As a dad, this allows me to check on my daughter when she’s downstairs playing in the basement, and I’m upstairs in the office. I can talk to her if I need to, and she can call for me if she needs help with something. This is more of a practical use feature for me than a security feature, but it adds to the system’s appeal because it can be used for both. 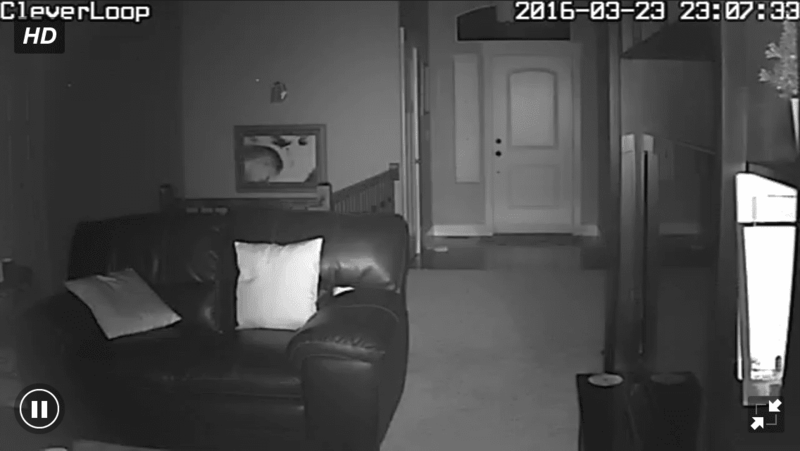 Here is a shot of the night vision in the living room. Wi-Fi setup for the indoor camera was very easy. 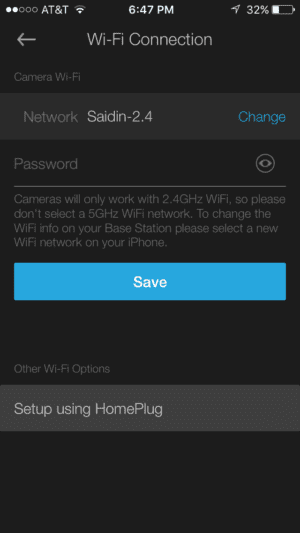 The camera did not have to be directly connected to the router in order to pair it with the system (see outdoor camera), and instead used audio signals sent from my smartphone to connect to the network. The outdoor HD video quality was similar to the indoor camera’s quality. The 115-degree FOV lens on the indoor camera left us wanting a little more, and the same goes for the 60-degree outdoor camera. My rambler-style home has a recessed porch and the limited field of view did not allow the camera to monitor my front door effectively, creating close-quarter blind spots. We had blue skies for the entirety of our test and couldn’t test the camera in an actual rainstorm (not that we’re complaining), so instead we hosed it down to see if really is waterproof, and everything worked as advertised. 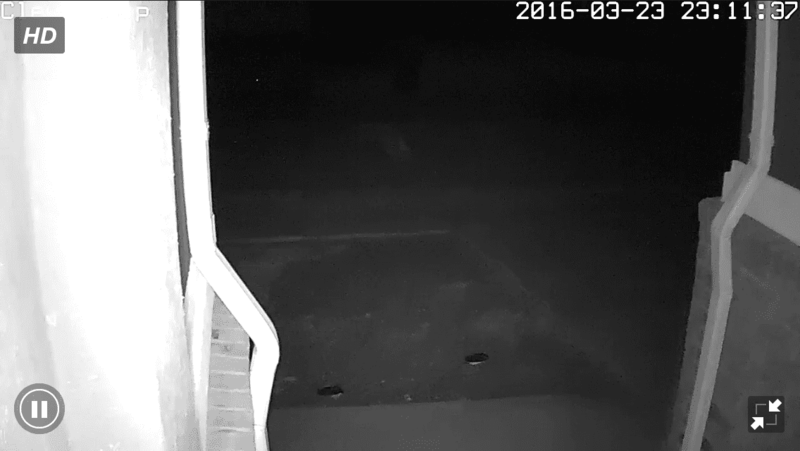 The automatic night vision on the outdoor camera left something to be desired. Here is a shot of my porch, which is about 10 feet deep. Beyond the edge of the porch You can see another 20 feet or so to the edge of the sidewalk before it goes completely dark, however this would capture someone approaching my front door in complete darkness. The outdoor camera had to be plugged into my router for its initial setup, which wasn’t a huge deal, but it was a minor annoyance. 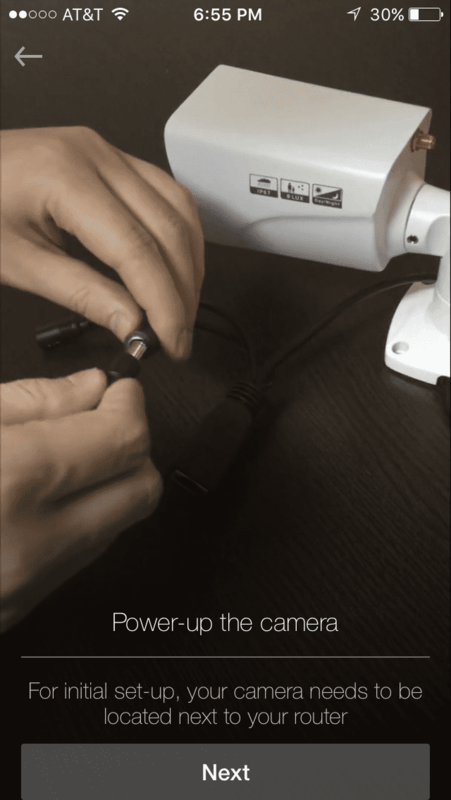 If the indoor camera doesn’t need a hard connection to be set up, I don’t know why the outdoor version should be any different. Once the camera was registered on the network, the Wi-Fi connected in about 115 seconds (25 seconds longer than the app suggests), so be patient while the app is counting down your connection, as it might take a little bit longer. The Wi-Fi signal was very strong and I never had any connection issues, even as I unplugged and moved the camera to multiple different locations outside my house. We really like that the camera supports both Wi-Fi and Ethernet because it makes it more versatile. I’m really nitpicking here to fill out the “cons” section. I really liked the CleverLoop system and had very few complaints. What’s the CleverLoop customer service like? Probably the best part about CleverLoop customer service is that I never needed to contact them. I’m a big believer that the customer experience starts before I ever pick up the phone. The product itself should be a good indication of whether the company cares about its customers, and in our opinion, CleverLoop succeeds here. But we dove into CleverLoop customer support anyway to see how they handle potential problems. CleverLoop does not have a customer support phone number and instead opts for a very thorough FAQ page and a support-ticket-based customer service program. We submitted a support ticket to see how quickly CleverLoop would respond, and we were contacted within 10 minutes. They gave clear, concise directions on how to solve our fabricated problem (outdoor camera won’t connect) and linked suggested several points on their FAQ page that could help troubleshoot any further problems. Overall, we were very impressed with CleverLoop’s customer support. I prefer online correspondence instead of waiting on the phone all day long; however, having a customer support line for those who prefer over-the-phone troubleshooting would add to an overall great customer experience. Overall a great product, I would not hesitate to recommend it to anyone interested in such a solution. Great security system, once you get everything up and running. I’ve been up and running with the system for 6 months now and I’ve been very happy. The system works well, the motion identification feature of the system works great with notifications sent directly to my phone when it detects movement. The system is easily armed and disarmed via app and my cameras connect quickly in the ‘live’ feed mode. 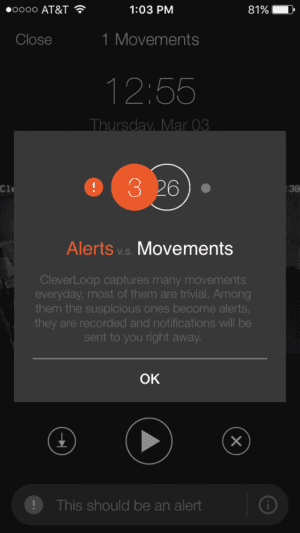 Set up was tricky… (until) CleverLoop updated their phone app. With the new version of the app the third camera installed perfectly on the first try. Looks like the install kinks were worked out on the new version of the app. 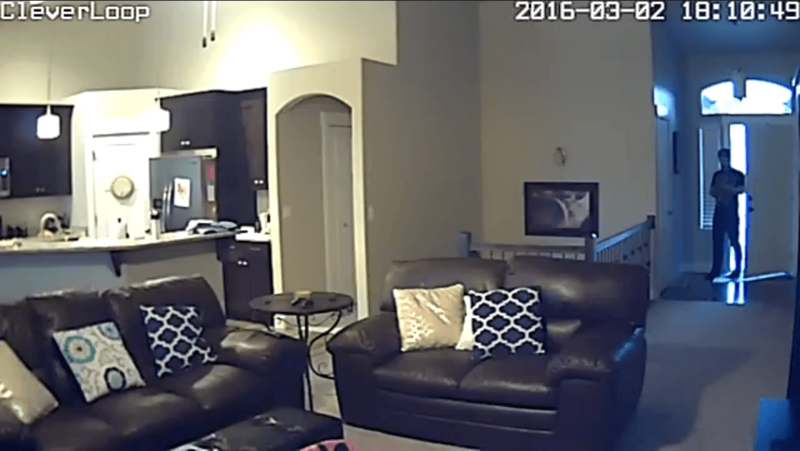 Picture quality of the cameras is average, but it’s good enough in most home applications. Its not as clear as your higher end HD camera systems but it definitely gets the job done and it’s easy to switch between cameras… Videos of detected movement are stored locally and can be played back later. The app is clean, intuitive and well designed, you can easily monitor views and play back recordings. There are also features to fine tune the motion detection setting to minimize false alerts. *There were relatively few negative reviews to be found about CleverLoop, which is pretty cool and should be further confirmation that this is a system that people like, and works well for them. Absolutely! When I have a hard time coming up with things for the “Cons” section, then you know that I really liked the system. The smart surveillance was the most impressive feature, followed closely by its geo-fencing capability. 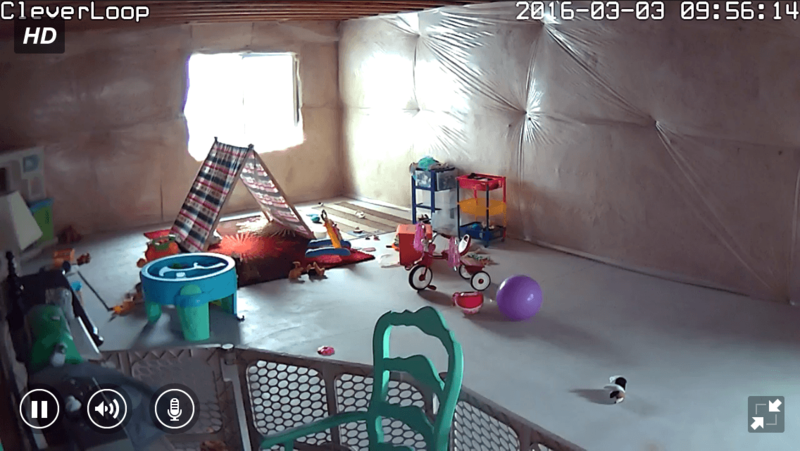 I love that CleverLoop can be used as a serious security camera, but also for more practical parenting needs. Lots of systems have mobile apps and notifications but CleverLoop stood out for its smooth, user-friendly interface and extensive customer support resources. At $349 on Amazon, its hard to find a better system for the price. Something to consider: If you’re are interested in reading our overall rankings of Top Rated Security Camera Reviews and how we ranked them, or if you have specific things you’re looking for, consider checking out any of these articles: Best Night Vision Cameras, Best HD Security Cameras, Best Cheap Security Cameras, Best Outdoor Security Cameras, Best Hidden Cameras, or Best Dash Cams.